So pretty! Love her bag and boots..
What a gorgeous woman, and a great outfit, and the hat is deadly! Love it! Hmmm. A little bit too much? Nice bag and amazing style! i love her style!!! and her bag is amazing!! The shearling coat, long skirt + hat combo looks warm and surprisingly chic! I love the angle you caught her at. one of my fave photos you’ve taken! you look beautiful, heather, as always!! Looks like Preetma Singh . . .
Beautiful layers. I want those boots. This look is my style inspiration du jour. What a great look! 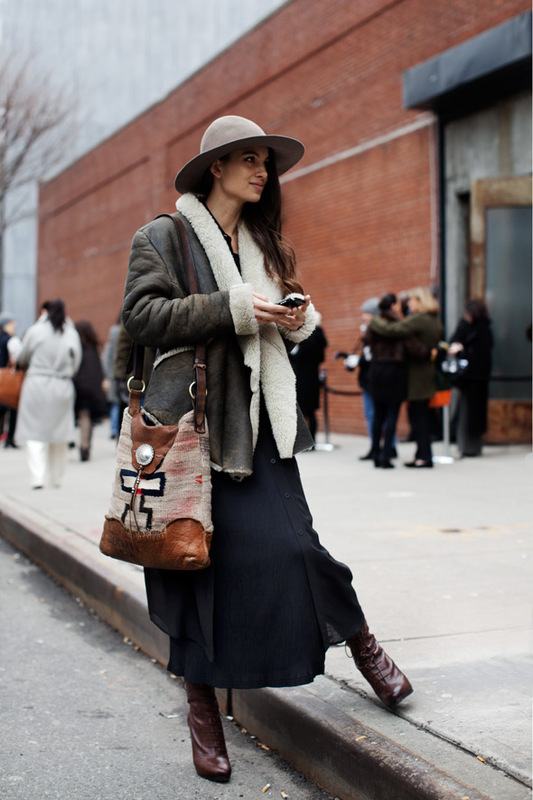 The shearling coat, the hat, the bag…warm and earthy and beautiful! Just wonderful! Cosy-looking yet utterly stylish..I want that hat! Mix of epic and countryside look ! Elegant, I love ! Outside Ralph Lauren fashion show’s, that is exactly where to run into some of the most amazing and beautiful street styles! A modern day pioneer woman! The look is a bit heavy, but she’s tall and beautiful enough to pull it off. Well captured. Visit the shiny, brand new blog http://www.offdutychic.com & let me know what you think. I’ve now published my fourth post! Beautiful combination of clothes and nice boots. Congratulations! Totally love the whole boho inspired look. She is stunning. want bag and jacket!!! great combi, nice girl. The bag is so unique! It adds a lot to the look in my opinion. Kind of Amish meets Aztec (handbag). Doesn’t work for me. Beautiful girl, though! I have this same jacket though in a much more fitted format.I think it comes off as a bit too heavy on her and makes her look too small for it. However, I love the concept of jacket and long skirt…. It’s a little heavy on top, with the big hat, the big wide coat and the big purse. Combined with a sheer skirt, it looks a little out of proportion. I do like the combination of styles here, though, the cowboy and the high heels. Gives it a modern edge. that bag is freakin’ awesome! I see a happy girl in the foreground but immediately notice some happy friends hanging onto each other in the background (far right). What a gorgeous grey day with a super cozy neutral look up front. She looks amazing! Love her coat and the boots are so cute! In LOVE with the shearling jacket, wonderful picture as always. Fantastic outfit. Nonchalant, chic, luxuriant. Lovely, charming face. Now this is what I call layering! Actually refreshing to see winterwear in winter after coming from Garance’s blog (and being here in LFW) where spring wear is already in full swing despite the freezing cold! I love EVERYTHING going on here! Perfect details. I love that coat… so stylish! Fantastic colors and textures. And the hat is wonderful! She’s so giving me modern day Pocahontas right now. The boots are amazing. I love it. I really enjoy the way she smirks…there’s something really interesting about her! A weird case of getting it right by doing everything wrong. That maxi look would be a disaster on anyone older, shorter, wider. But I like people who take on the challenge of wearing a lot of clothes – sick of fashion editors who think style is all about exposure. Everything is perfect hear – colours, bag, hat – I love it:). Who is she? Very beautiful! Beautiful “peau lainée” (don’t know how to say this properly in English) anyway, nice picture as usual. I really like brown and army green for winter, so much more fun than black. Army green the new black ?! Beautiful and breathtaking photos. Thanks for sharing. Beautiful and breathtaking photos. Thanks for posting. I must agree with some others – she is SO pretty but the heavy clothes are just not doing any favours – all a bit weighed down. Still it’s winter so we need to keep warm and I am sure she’s doing that so good for her. Staying warm during fashion week always looks like a brave move considering all the bare legs, sandals and short sleeves etc etc! The jacket is perfect. It pulls the whole look together. Does anyone know who it is by? Love that kind of hat wore with large clothes. What makes this look so attractive is that it seems to be made for a real life, yet a life that is fanciful as well as practical. Every item is top-notch quality, it seems, and comfortable yet “snazzy”–one of my stylish grandfathers’ favorite words. Flawless alltogether. Great bag, wonderful shoes, brilliant skirt and the girl is just charming…Such a pleasure to look at. Love the purse and hat! Where can i buy it?